MCM provides customized metal stampings service for different demands from customers worldwide. 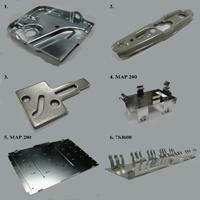 Every procedure from mold developing, designing to producing is under strict quality control to satisfy your demands. They are available for various applications, for example, industrial machinery, computer accessories or auto parts. Metal stampings include ranges of sheet metal forming manufacturing processes, and it includes one of the processes like blanking, embossing, bending flanging and coining. MCM Stamping Co., LTD. is a custom, short run metal stamping facility specializing in low-cost lifetime tooling on production runs from hundreds to thousands of pieces per order. We put efforts on developing a proprietary tooling method of manufacturing very simple to the most complex metal stampings. This presents you that we are a reliable manufacturing in the industry. With years of experiences, we have standard procedure and professional technique to make complete products for different applications. The metal stampings are all measured and tested according to the measurement of the materials. We can offer you the most suitable items for your machines or other applications. Just feel free and contact us today for more information!